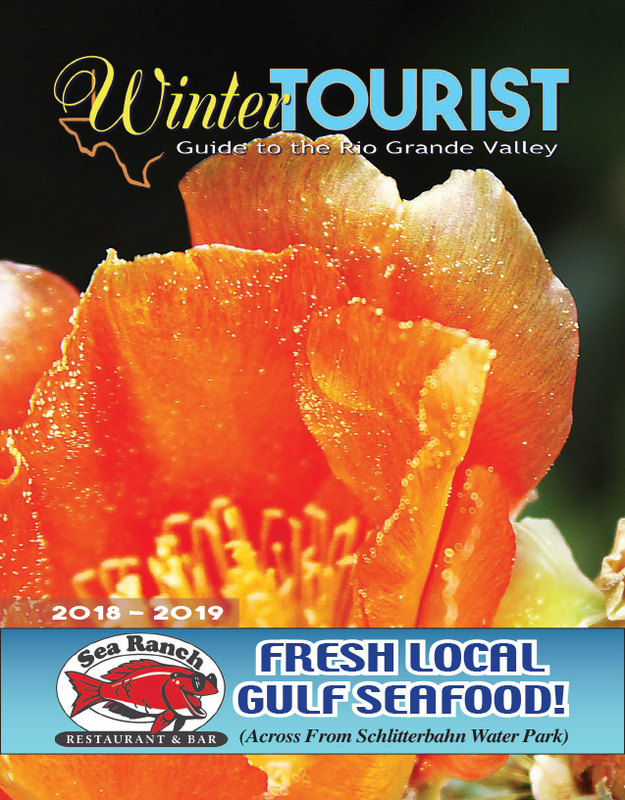 As a cold front moved into the Rio Grande Valley last week, local residents began bracing for what they knew would come with the cold north wind: dozens upon dozens of brown pelicans whose clumsy flight would be stalled by the powerful downdrafts over Highway 48. Almost a year ago to the day, a different cold front blew through resulting in a massacre of brown pelicans that was nearly unbelievable in its severity. Over 100 birds were killed after being stranded on the high speed highway that connects Brownsville to Port Isabel. After that event, a group of concerned residents banded together to form a partnership between themselves and local law enforcement in order to prevent similar bird strike incidents from happening again. “We know when this is going to happen — when we have a strong north wind,” said longtime wildlife photographer Richard Moore Tuesday. Sure enough, as the wind speeds picked up Thursday afternoon, the birds — which were listed as an endangered species as recently as 2008 — began to fall out of the sky by the dozen. We know when this is going to happen. Brown pelicans are one of the Endangered Species Act’s success stories. After their population decreased due to the use of the pesticide DDT, they were a scarce sight around the Laguna Madre for decades. Moore and Port Isabel Mayor Juan Jose “J.J.” Zamora remarked just how rare it was to see a brown pelican here. “When I was a kid down here, we didn’t have brown pelicans,” Moore said. But conservation efforts, as well as the partial restoration of the Bahia Grande, were instrumental in helping the bird’s population recover, said Boyd Blihovde, refuge manager at Laguna Atascosa National Wildlife Refuge. “Folks have to remember that from about the 1930s to 2005, Bahia Grande wetland, which is a really prime wetland and potential nursery, was dry. It was completely bone dry,” Blihovde said. “It had very little value for pelicans or other bird species,” he said. Today, the pelicans can be seen throughout the region, often coasting over the Gulf of Mexico in angled lines like ducks, or floating on the waters of the bay, or perched on pylons in the channels that twist through The Fingers in Port Isabel. Drivers who travel back and forth to Brownsville can often see the birds flying low over the highway near the pilot channel that feeds the Bahia Grande with a fresh influx of seawater. The birds head west into the setting sun to find their roosts for the evening. “Yesterday was just a perfect storm. 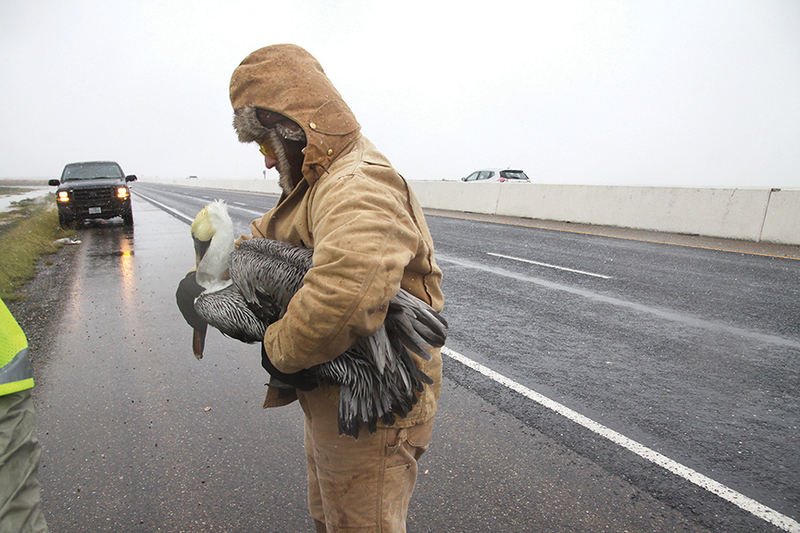 Everything lined up to make it a really difficult day for these birds,” said Texas Parks and Wildlife biologist Willy Cupit as he stood in the shoulder of Highway 48 Friday morning, a pelican carefully nestled in his arms. “It doesn’t happen that often, where we see it this bad, but when everything lines up, it is that bad,” Cupit said of the number of pelicans that became stranded on the highway the day prior, Thursday. The cold front quickly triggered a response from local volunteers and several different law enforcement agencies. Officers from Texas Parks and Wildlife (TPWD) and the Department of Public Safety (DPS) converged on the highway, as did the Port Isabel Volunteer Fire Department. Blihovde arrived on the scene, as well, to lend moral support, he said. “When I got there I quickly noticed that it was a bigger incident than we had seen before … even more so than last year,” he said. Moral support morphed into action, as he, too, began to rescue birds. “The estimate was 170 got carried across the road physically … and then released on the other side,” Blihovde said. Yesterday was just a perfect storm. Everything lined up to make it a really difficult day for these birds. As a journalist, Moore originally intended to document the event in order to better educate the public. But, like Blihovde, he was soon overwhelmed by the scale of what was happening. “For three hours, it was intense. … It was just nonstop,” Moore said of the number of birds that became stranded on the roadway and were rescued by volunteers and law enforcement. “It was just an incredible outreach effort by about 10-12 volunteers,” Moore said. “It was a real outpouring of concern and effort,” he said. “All these folks that are helping are just the greatest people,” Blihovde said in a phone interview Wednesday. “This is a great example of American citizens taking responsibility for what’s happening out there and doing something. Taking charge to do something to fix a problem. Not just complaining about it but actually doing something,” he said. “Everybody worked together in a coordinated fashion,” Moore said, but acknowledged the danger of being on such a busy roadway on foot. He credited the work of law enforcement, who positioned patrol vehicles on both sides of the highway, with alerting drivers to slow down. “They were great. I cannot thank the Department of Public safety officers enough. They did a fabulous job,” Moore said. “That makes the department, it makes us happy. Anything that we can do to help out… not only the volunteers, but the wildlife,” said DPS Sgt. Isaac Juarez, who mobilized the officers Thursday. “Our role at the scene was the safety of the volunteers that were assisting the safety of the pelicans,” he said. As Willy Cupit held the pelican, carefully holding its bill against its chest to keep it calm, another scientist hurried to collect samples from the carcass of a pelican which lay nearby. Lianne Koczur is a post-doctoral researcher from Texas A&M University. She came to the Rio Grande Valley to research why the pelicans are so affected during winter weather events. “This project is being funded by the Texas Department of Transportation and we’re examining the daily and seasonal movements of pelicans in the region just to try and understand more the ecology of these birds,” Koczur said. “That’s what we’re trying to figure out. It’s temperature thing. It’s a wind direction thing. It’s a wind speed thing. It’s a time of the day thing. It’s a time of the year thing. Also, the precipitation,” Kupit added a few moments later. Richard Moore said the issue has been known for at least the last six years. He and others have pleaded with TxDOT to take make changes to the barriers which divide the highway. The solid concrete jersey barriers create a windbreak that results in the powerful downdrafts that cause the pelicans to lose the lift they need to remain airborne. “All of a sudden they lose lift in their wings and they just plummet to the roadway,” Moore said. The call for action became much louder after the pelican deaths of 2016. As refuge manager, Blihovde has worked with TxDOT on numerous occasions on partnerships aimed at protecting critically endangered or threatened species. Most recently, U.S. Fish & Wildlife partnered with TxDOT in a project to construct wildlife underpasses along Highway 100. That project came about after several rare ocelots were struck and killed trying to cross the highway. “It’s frustrating for the public because we want to have something done right away,” Blihovde said. But he was heartened by the presence of Koczur and her research into the pelicans. “TxDOT is trying to do what they can,” he said. Too, he recently attended an informational session with TxDOT to brainstorm short term and long term solutions to the issue. “We came up with 5 or 6 potential solutions that TxDOT has promised to look those over,” Blihovde said. And they continue to offer law enforcement support for future occasions when volunteers rescue more birds. “This is going to keep happening,” Blihovde said. For him, the worry extends beyond the birds. He worries eventually the downed birds will cause a major traffic accident. “It’s an unsafe situation on Highway 48 right now and we really need to try to come together,” he said. “I feel like it’s only a matter of time before there’s a pretty serious accident – a vehicular accident,” he said. “Slow down, especially when we have these conditions. Slow down, pay attention. These birds come out of nowhere,” Cupit said as traffic whizzed past him Friday. “If there’s a patrolman sitting at the bridge with his lights on, he’s there for a reason. This doesn’t happen very often during the year, but when it happens everyone needs to be aware and be considerate,” he said. It would be so heartbreaking to lose them again. Moore, who has spent over two decades documenting the wildlife of the Rio Grande Valley, reflected on the journey the brown pelican has taken over the course of his career — from being on the verge of extinction, to nesting by the dozens in the quiet lagoons of the lower Valley. “They’re iconic. They represent wildness and beauty,” he said. “It would be so heartbreaking to lose them again… If we keep letting things like this happen,” he added a few moments later.